The statistics offered by the government and the FED are not to be trusted. We’ve long known that the Consumer Price Index (CPI) is manipulated in ways that are intended to mask the increases in the true cost of living for the average American. The same is true of the unemployment numbers. Amidst all the happy talk of economic recovery, wages (in real terms) continue to decline and debts continue to mount up. Charles Hugh Smith in his recent post, What If We’re in a Depression But Don’t Know It?, provides some eye-opening charts and convincing narrative that makes it plain that economic depression is the current reality for all but the top 5%. But it’s not only the U.S. that is in trouble, the depression is worldwide. The financial crisis of 2007-2008 was only the beginning of what some call “the great unraveling” There are any number of commentators that provide further arguments on that score, including Thom Hartmann (The Crash of 2016) and Gerald Celente. But no one besides myself is pointing out the underlying cause of all these problems. It is the monopolization of credit by a banking cartel, in collusion with top government officials, that creates money based on interest-bearing debt, a formula that centralizes power and concentrates wealth in the hands of what Hartmann calls economic royalists. By their control of the monetary machinery they are able to lavishly fund weapons, war, and the global corporatocracy, while making money scarce for everyone else. Further, this system is not sustainable because the interest burden causes debts to grow continually with the passage of time. Central governments have assumed the role of “borrower of last resort,” to keep the money supply pumped up and the banks from failing. This cancer has metastasized and the end is near. –t.h.g. If you close the browser window or tab while it is playing, you’ll have the option to go to the written transcript. In either case, pay close attention to the startling charts that make a strong case that hyper-inflation is looming on the horizon. Some writers have been arguing that deflation, rather than inflation, is the more likely prospect, but that case us built upon a misapplication of term “deflation” and an incomplete consideration of the pertinent factors. In reality, it is not an either-or situation. Strictly speaking, both inflation and deflation are monetary phenomena. As I’ve said before, when speaking about inflation, one must distinguish between currency inflation and price inflation. Price inflation or the cost of living can be affected by a number of causes, but the usual and primary cause is currency inflation, that is the debasement of a currency by the monetary authorities by creating money on an unsound basis, notably, the monetization of government debt. Deflation is the opposite of inflation; it is the contraction of the overall money supply by the banking system. That’s not what we’ve been seeing. The overall money supply has been increasing—inflation. However, the money has not been going to the private productive sector but to the public sector (government) to use for bank bailouts, weapons and wars, expansion of the national security state, and extension of imperial dominance around the world, all of which are wasteful and useless. The bad debts that were created during the latest (real estate) bubble have not been written off, they have for the most part simply been taken over by the government. People who serve within those realms benefit from the inflation, they have plenty of money to spend, but the productive sector is being starved for money and credit. Businesses often depend upon bank financing for working capital. When banks are unwilling to provide it, they are bankrupted and workers lose their jobs. Hence we have both currency inflation and depression at the same time. It’s as if there were a huge counterfeiting ring using bogus money to gobble up a large proportion of the available goods and services from the market. Counterfeiters only take; they do not put anything of value into the market. Hence, as real value is drained from the economy, sellers raise prices in order to compensate for the increased supply of money. Meanwhile, those who find themselves among the army of the unemployed are willing to take less pay for whatever work they can find in order to acquire basic necessities of life. As the government and monetary authorities continue with their wrong-headed “stimulus” measures, they simply make matters worse, assuring the eventual destruction of the dollar as a reliable measure of value and US government bonds as a safe store of value. None of the proposals now on the table in Congress or the financial press will solve the dilemma. As I argued in my recent article, The World’s Ominous Reckoning, that appeared in Reality Sandwich, The problem is structural and systemic. The system is designed to create debt, and ever more of it. Like a pernicious cancer, debt is a parasite that is killing us, and in the end a parasite will die along with its host…. interest must be eliminated from the money system to put an end to the growth imperative. [For more evidence of inflation and its effects in today’s economy, see also my previous blog post about inflation, Chris Martenson: Inflation Is So Much Worse Than We’re Told]. This 2010 recap from the National Inflation Association makes it clear that we are in the midst of an inflationary depression. Paul Craig Roberts: Can the Economy Recover? The “New Economy” was based on services. Its artificial life was fed by the Federal Reserve’s artificially low interest rates, which produced a real estate bubble, and by “free market” financial deregulation, which unleashed financial gangsters to new heights of debt leverage and fraudulent financial products. The real economy was traded away for a make-believe economy. When the make-believe economy collapsed, Americans’ wealth in their real estate, pensions, and savings collapsed dramatically while their jobs disappeared. He then goes on to identify Goldman Sachs as “the bankster firm [that] controls the economic policy of the United States.” Read the full article here. How Bad Will the Economy Get? It continues with an outline of recent and historical developments that make the case, but concludes on a hopeful note with my brief description of existing cashless exchange mechanisms that are not dependent upon political money or banks. You can read the complete article here. – t.h.g. 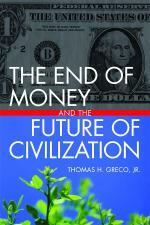 My latest book, The End of Money and the Future of Civilization , can be ordered from Chelsea Green Publishing, Amazon.com , or your local bookstore. You can also read a preview at Google Books. Demurrage: is it a good idea for a local currency or exchange system? Commercial Trade Exchange Architecture and Operations—A Conversation with Chip Davis and Charlie Davis by Thomas H. Greco, Jr.
Libertad de expresión contra las cuerdas. Recuperando el crédito de los comunes. Rumbo a una Sociedad Mariposa. 2009 (April) Thomas Greco's Interview by Kim Hill of Radio New Zealand. 2009 Interview on Green Planet Radio, New Zealand. 2009-11-05 Thomas Greco Interview on KBCS, One World Report. The Siege of Venezuela–What are the facts, and who’s to blame? Local Currencies—what works; what doesn’t?